Having trouble finding Tarot classes that fit your busy schedule? Do you live in an area where there simply aren’t any Tarot classes? If so, Then the Magdalena Tarot Method is for you! What is the Magdalena Tarot Method?The Magdalena Tarot approach to Learning Tarot is a revolutionary method developed from mixing symbol, Qabalah, astrology, numerology and mediation in a way that allows you to “absorb” the meaning of the Tarot through the senses without the hassle of memorizing card meanings . This hands on learning technique not only teaches you the meaning of the Tarot, but brings the meaning of each card we study alive in your daily life. We will do this through building altars. The altars become focal points for the contemplation and meditation on the cards. When built correctly, these altars also serve as “machines” that will peel away the excess and transform your mind and spirit. This is more than a class, it’s a life changing journey. Only those who are serious about understanding the living Tarot should enroll in this class. If you’re ready to live the mysteries of the Tarot, enroll in this class now. * The text of the Unit created by me. * A live webinar with me once a month that will discuss the unit and answer any questions that you have. * Access to me through e-mail for extra help and support. * 15% off discount in my Etsy Shop, Magdalena Tower, where you can purchase things for your altar plus exclusive vintage and antiques that are unlisted on Etsy. You will also have access to special, unlisted items before they go up and the chance to negotiate prices. Ready to Enroll? Hurry! ENROLLMENT FOR FEBRUARY CLOSES 2/1/17! 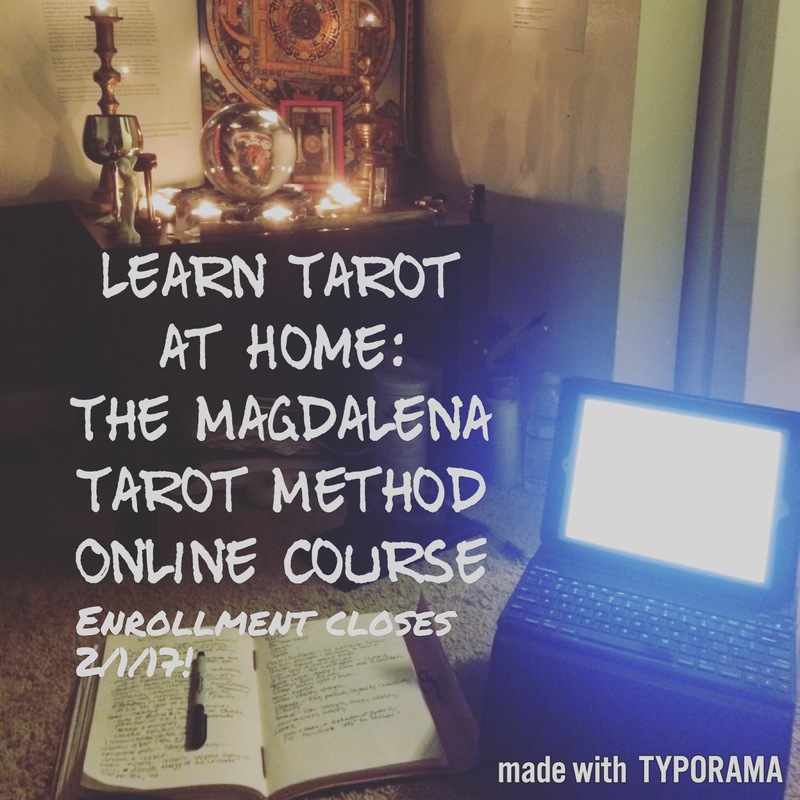 Go to ✨https://magdalenatarotinc.com/magdalena-tarot-method-class/✨ to find out more and enroll! This entry was posted in art, Astrology, Books, dreams, mysticism, mythology, numerology, occult, Qabalah, Runes, self help, spirituality, Tarot, Uncategorized, witchy, Writing and tagged astrology, card a day, divination, inspirational, motivational, numerology, occult, online Tarot class, pagan, self empowerment, self help, tarot, tarot class, tarot teaching, witchy. Bookmark the permalink. Reblogged this on November 9th.